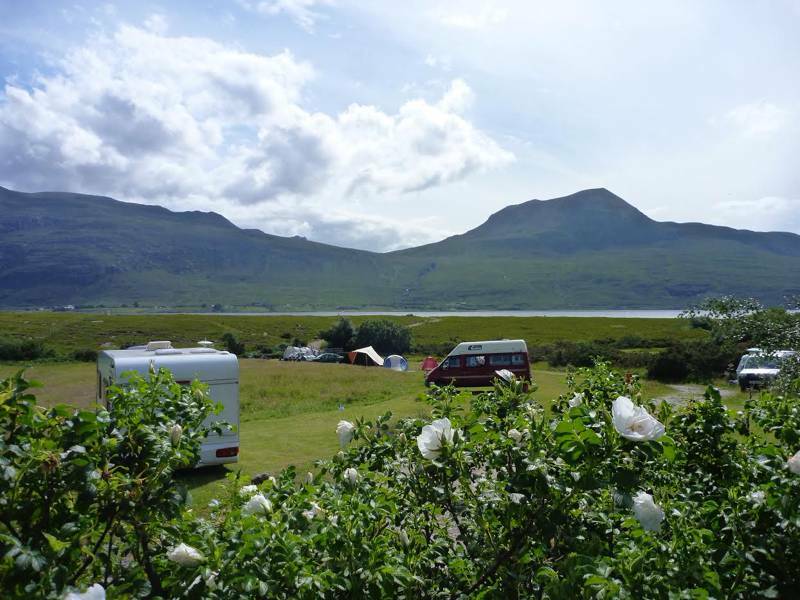 Camping pitch on our lovely lochside campsite suitable for tents, cars & small campervans. Grass pitch with Electric Hookup. How does it feel to get to the end of a track that’s eight miles from the nearest main road, in a remote corner of north-west Scotland? That’s a question that Badrallach’s owners, Owen and Christy, have put a great deal of thought and effort into answering. Around the campsite, mountains rise into the north and east. Venture out and you may well return wet/muddy/sweaty/all three in the course of a day, so you want showers that do more than tickle and tease. The loo block itself may be in an old farm building, but it is still one of the brightest and most welcoming washing facilities we’ve seen. And finally, since this part of the world is the haunt of the mischievous highland midge, Badrallach Campsite boasts a hearty stock of midge repellents, nets and hats, plus it offers yet more encouragement to light that evening campfire. Nature has also laid on a smorgasbord of adventures for you to savour. Sit at Badrallach for any length of time and you’ll become fascinated by mighty An Teallach, the mountain that sits over the loch, hunching its shoulders and glowering. If you do climb this splendid hill, remember it is one of the most precipitous ridges of any mountain in Britain and you should be fully prepared (in mind as well as body). If you fancy a more casual wander, there are paths running directly from the campsite along the foreshore and up to Beinn Ghobhlach, the hill behind the site. 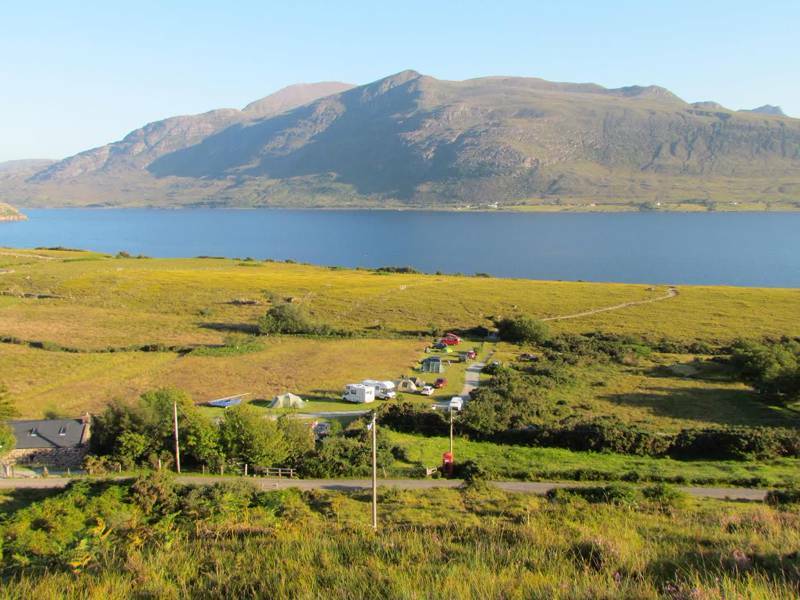 The campsite also looks over Little Loch Broom, which is reached by a short path. If you are a paddle-fanatic you’ll find the crinkled coastline fascinating to explore by kayak, and site warden Chris Davidson – a Highlander who’s been scouring this coast his whole life – is happy to lend advice if you’ve laden your car with fishing tackle too. A little further along the coast is Scoraig, one of the most remote communities in Britain, which is only accessible by boat or a five-mile walk. Kayaking there takes a little while, but that’s just the kind of thing you’ll have time for. Indeed a slower pace of life is just the appeal of this part of Scotland. It’s certainly something that Owen loves about the place. A qualified botanist, herbalist and wilderness therapist, he has recently begun running nature-oriented workshops at the campsite, incorporating herbal medicine, stress-management and creative approaches such as music, art and writing. And, whether you come here to partake in soothing stress-relief or simply want a loch-side tent pitch, once you’ve been at Badrallach for a few days you, too, will settle into a new rhythm of existing. Time drifts here and pulls you along with it. So when you’re finally packing up, you’ll find yourself asking a very different question – how will it feel when you return to the world at the end of the road eight miles away? For latest availability and best prices for Badrallach, please use the Date Search above. 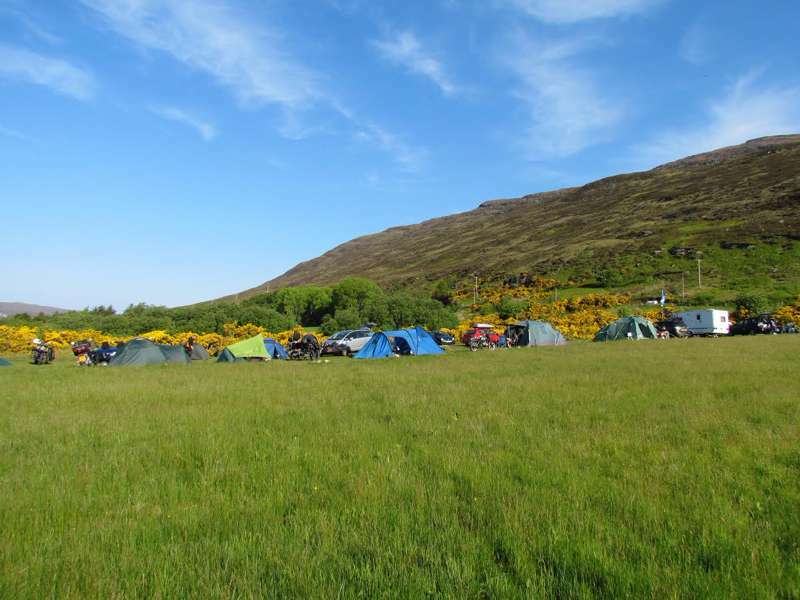 There is a base price of £3 per night to cover a tent or campervan. Then it's £6 per adult, £3 per child (2–17 years old) and under-2s free. Cars are £3 per night as are additional tents and campervans. Electrical hook-up is an extra £3 per night. Pitches are spacious so you can fit a few tents and a vehicle on each one.